The Hindu INSPIRATION: The small village attracts farmers and policy makers. Photo: Special Arrangement. Is it possible to get a good yield without using chemical fertilizers? Will a shift to organic affect our food security? Can we manage insect pests without using pesticides? Will organic cultivation still be profitable for farmers? These are some of the often asked questions by farmers when problems of modern agriculture are being discussed. Enabavi, a small village in Warangal district, Andhra Pradesh promises to answer all these. Situated off the Hyderabad-Warangal highway near Jangaon town, Enabavi is today an inspiration for many other villages and farmers, thanks to the efforts of the local organization called CROPS (Centre for Rural Operations Programmes Society) supported by the Centre for Sustainable Agriculture (CSA). This small village attracts visitors ranging from farmers to policy makers who want to understand the concept of successful sustainable agriculture. In the last three years more than 10,000 people have visited this village. “Commercial crops like cotton are the main crops grown in the district. From 1997 onwards, large numbers of farmers’ suicides have been reported from this district. In the middle of this distress, Enabavi showed the resolve of a strong community which decided to take control of its agriculture in its own hands. “With just 51 households belonging mostly to the backward castes, the village started shifting to non-chemical farming about a decade ago. In 2005-06, the entire 282 acres was converted to organic farming. There is strong social regulation within the community towards organic cultivation to ensure that there are no ‘erring farmers” says Dr. G. V. Ramanjaneyulu, Executive Director, Centre for Sustainable Agriculture, Secunderabad. The elders in the village take the youth along with them. They have also started investing in teaching their school-going children the knowledge and skills of non-chemical farming. The farmers grow paddy, pulses, millets, cotton, chilli, tobacco and vegetables. They process their paddy and sell directly to consumers and also through a marketing channel called Sahaja Aharam in Hyderabad. Their average spending on chemical fertilizers and pesticides used to be around Rs.3,500 per crop per acre while it was around Rs. 500 per acre for seeds. The traders would dictate the price for the produce in addition to charging interest for the inputs supplied. Now, all of this has changed. The farmers do not spend a single rupee anymore for buying all the inputs. 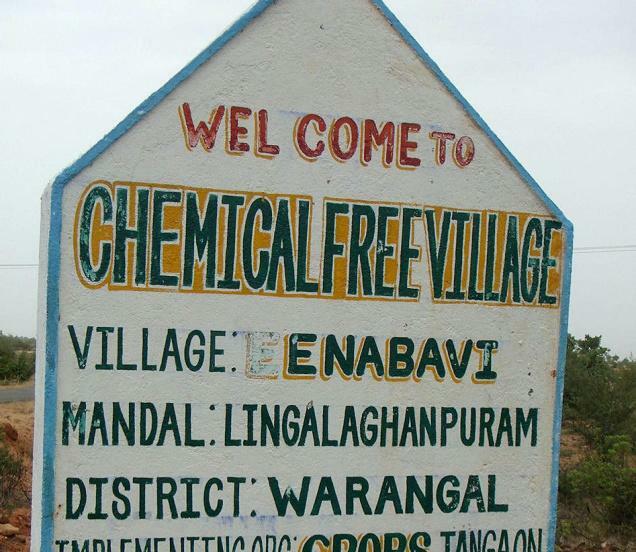 “In the 1970s this village like many others across the country, also went through the same process of using more and more chemicals to increase the productivity. By 1995 problems started showing up. Investments kept increasing but the returns were not good. “In late 90’s pests like red hairy caterpillar caused devastating effects in this region. The initiatives on managing the pest using non chemical approaches evolved into non pesticidal management which is now widely practised in Andhra Pradesh and other states. The confidence in using non chemical approaches, helped farmers to move away from chemical fertilizers towards sustainable solutions,” says Dr. Ramanjaneyulu. Some farmers started looking for options like using tank silt, poultry manure, vermi-compost and farm yard manure. They set up their own compost manufacturing units in their fields and started following various ecological practices. They also started to depend on their own seed for many crops, except for cotton. Now farmers also produce seeds for others. They have set up self help groups for men and women separately and started thrift activities too. As the farmers moved into more and more sustainable models of production they realized the importance of natural and common resources for sustaining their own livelihood. As a result the tank in the village was desilted and is presently being managed by the community. A cooperative called Enabavi Organic Farmers Cooperative was formed for supporting the several activities and to improve their collective bargaining power in the markets. “Today, Enabavi has many valuable lessons to teach other farmers, not just on how to take up sustainable farming. They also have lessons to share on social regulation, learning from each other, the benefits of conviction born out of experience and most importantly, the way out of agricultural distress by taking control over one’s own farming,” adds Dr. Ramanjaneyulu. Posted in Articles and tagged Enebavi, Organic Village.